"Restores MP relative to the amount of damage taken." Defeat Shan-Yu in The Land of Dragons. 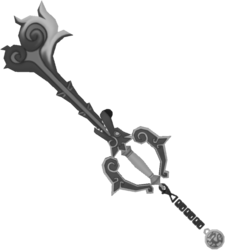 The Hidden Dragon is a Keychain for Sora's Keyblade that appears in Kingdom Hearts Re:Chain of Memories and Kingdom Hearts II. 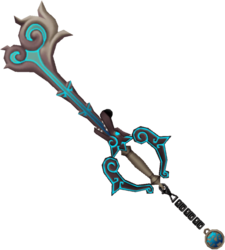 The Hidden Dragon Keyblade is designed with an oriental dragon theme. The guard is similar to the color and shape of Mushu. Its blade is a burst of fire coming out of a dragon's mouth, while the Keychain's token is the medal Mulan receives for saving the Emperor. The name for this Keyblade is most likely based on the title of the film Crouching Tiger, Hidden Dragon, which is also set in ancient China.